Get your iPad or iPhone ready for Super Bowl 2012. The Super Bowl 2012 starts at 6:30pm ET, but the pre-game Super Bowl coverage starts already at 2pm ET on NBC. 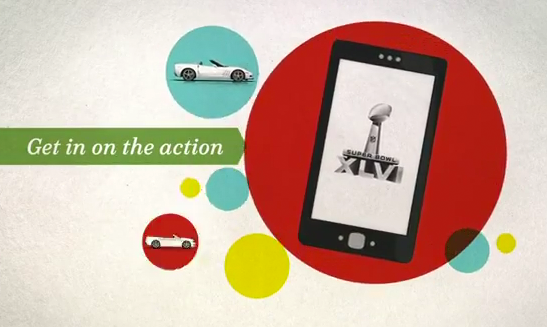 There are three must have apps for watching the 46th Super Bowl with your second screen. Get them installed ahead of the game to waste no time. Shazam is the essential app for watching the Super Bowl 2012 if you are mostly interested in the Super Bowl ads. Almost half of all Super Bowl 2012 Ads will be recognized by Shazam and unlock additional content. Shazam will link you to additional videos, special offers and giveaways. Shazam enabled ads include Toyota, Best Buy, Cars.com, Pepsi and Teleflora. The Chevy Game Time App is the key to the chance of winning one of 20 cars during the Super Bowl 2012. The Chevy Game Time App is asking live trivia about the big game and you get the most up-to-date stats. The app lets you unlock exclusive content, and much more. More details. The NFL Mobile app is what you need if you want to watch the Super Bowl 2012 on your smartphone. Besides the live stream of the Super Bowl, the app also has lots of other features including statistics and news.